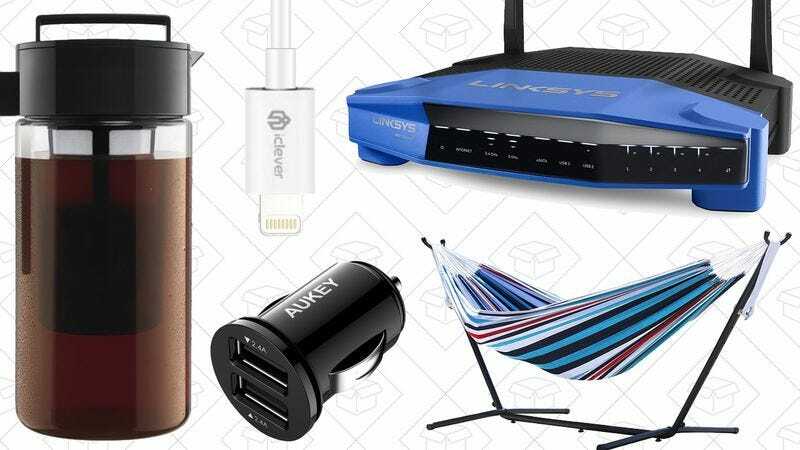 Whether you’re building a new PC, upgrading your home network, or just finally want to give mechanical keyboards a try, Amazon’s PC component Gold Box has you covered with nearly two dozen deals. Inside, you’ll find routers, keyboards, PC cases, graphics cards, mice, and more, all marked down to great low prices. And even if your personal battle station is as good as it can be, you can probably find a good gift idea in there for someone else. We listed a few favorites below, but head over here to see the rest. Just remember that like all Gold Box deals, these prices are only available today or until sold out. Warm weather may seem a long way off, but it’ll be here before you know it, and you can be ready to take full advantage with Amazon’s big hammock deal. Today only, Amazon’s selling popular Vivere double hammocks with steel stands for just $80, complete with free shipping. That’s the lowest price ever listed on these 4.7-star-rated hammocks, and an absolute steal when you consider what it must cost to ship a 33-pound box. The hammocks are all designed to hold two people weighing a combined 450 pounds, and the bed is made of 100 percent breathable cotton, so your cocoon shouldn’t overheat. This is a Gold Box deal though, meaning this price is only available today or until sold out. There are several color options available right now, but I’d imagine several will be gone by this afternoon. Cold-brew coffee might not sound appealing in the winter, but that’s only if you conflate it with iced coffee, which is not the same thing. Cold brew is just a steeping process that results in less acidity, among other benefits, and you can enjoy it hot or cold all year round. If you want to give it a shot, the Takeya cold-brew coffee maker is the easiest way to get started, and it’s only $18 today. This non-coffee drinker bought one of these a few months ago, and I’m absolutely in love with it. All you have to do is fill the basket with ground coffee, fill the container with water, and let it steep overnight in the fridge. The resulting coffee concentrate needs to be watered down, so one batch should last you several days. Amazon has listed slightly lower prices on a few occasions, but $18 is still several dollars less than its usual going rate. Our readers’ favorite USB car charger just happens to be the smallest one you can buy, and you can grab two on Amazon for $12 today. These make perfect stocking stuffers, so this is a fantastic opportunity to stock up. Just add two chargers to your cart, and use promo code AUKCARCC to save $6. Note: Black model only. Be sure you’re purchasing from Aukey’s Amazon listing, not the direct Amazon listing. For just $4 to $5 today, you can sip your drinks in style with a four-pack of stainless-steel straws, either bent or straight. I own the bent ones and use them for everything from Coke Zero to Moscow Mules. And don’t worry, they come with a little tube brush to help you wash them. For more great deals from around the web, be sure to head over to today’s main post on Kinja Deals.